Recorded at the Science and Nonduality Conference. There is a perennial debate in spiritual traditions regarding whether realization is direct (sudden) or progressive (gradual). But is this a false distinction? Realization is often sudden, no matter how many years of practice may have led up to it, and even after realization, most people find that refinement, clarification, and the working out of personal shortcomings continue indefinitely. Who wouldn’t prefer direct realization to years of purification and practice? But how many examples of purely direct realization can we find? Can a path be both direct and progressive? Is it possible to have a taste of our true nature from the outset, and then spend a lifetime clarifying and embodying it? Also, is there one watershed breakthrough which can be universally agreed upon as final “Realization”, or are there many degrees and stages of realization, each of them important stepping stones in a never-ending journey? Proponents of the direct path sometimes argue that if we regard spiritual development as progressive, we will forever be anticipating, never arriving. But some spiritual seekers, not appreciating the distinction between understanding and experience, mistake intellectual understanding with enlightenment, and consider themselves “finished” when they are just getting started. 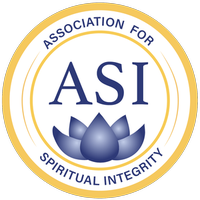 Isa Gucciardi, Ph.D. is the Founding Director of the Foundation of the Sacred Stream, a school for consciousness studies in Berkeley, CA. Isa is also the creator of the spiritual counseling model, Depth Hypnosis, and author of two books, Coming to Peace and Return to the Great Mother. In addition to her teaching schedule that includes teaching classes in Applied Buddhist Psychology, Applied Shamanism, Integrated Energy Medicine and Depth Hypnosis, she has active practices in Depth Hypnosis and Applied Shamanic Counseling in San Francisco, CA. For more information, please see sacredstream.org. Batgap interview with Isa and Robert Thurman. David F. Buckland has a graduate degree in Vedic Science and researches and writes on subjects related to the approach, shift, integration, and embodiment of the stages of enlightenment. This reflects a 40 year unfolding that has been prominent for much of his life. But with a more recent series of profound shifts, the exploration became the life itself. Under the pen name Davidya, he brings ancient teachings into modern life. After many years of research, he published the book Our Natural Potential: Beyond Personal Development, The Stages of Enlightenment in 2017. Michael Rodriguez – Drawing always from his direct experience, Michael speaks with great clarity and compassion about the undivided nature of Life or Consciousness, pointing to reality in a way that is free from dogma, ritual, or adherence to any particular tradition. He also draws skillfully from the world’s wisdom traditions and integrates Jungian psychology, literature, music, and art into his work to address the full range of human potential. He offers meetings, retreats, and private sessions here in the United States and abroad. All his work, including his interviews on Buddha at the Gas Pump and Conscious TV, can be accessed via his website: www.BoundlessAwareness.org. This entry was posted in Group Discussions, Guest by Rick Archer. Bookmark the permalink.